Genuine OEM Dell Toner Cartridge, Cyan, 700 page yield. Dell part number: 331-0723, YPXY8, YX24V. Color Laser Toner Cartridge compatible with Dell 1250c, 1350cnw, 1355cn, 1755, C1760nw, C1765nfw. Compatible Dell Toner Cartridge, Cyan, High Capacity 1,400 page yield. Replaces Dell part number: 331-0777, FYFKF, PDVTW. Color Laser Toner Cartridge compatible with Dell 1250c, 1350cnw, 1355cn, 1755, C1760nw, C1765nfw. Compatible Dell Toner Cartridge, Yellow, High Capacity 1,400 page yield. 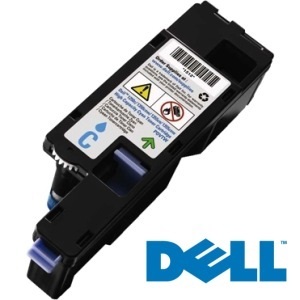 Replaces Dell part number: 331-0779, DG1TR, 5M1VR. Color Laser Toner Cartridge compatible with Dell 1250c, 1350cnw, 1355cn, 1755, C1760nw, C1765nfw.